Fairly uncommon species that doesn't grow very large. This specimen is larger than most. 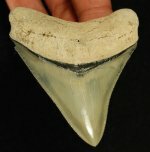 Extremely rare jaw from a deep water shark that is rarely offered for public sale. 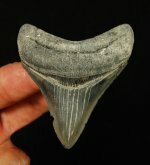 This shark has no known living relatives and its teeth closely ...more info. 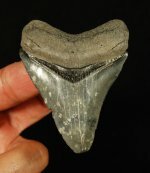 Very nice, symmetrical tooth with sharp serrations and tip. These stands will give your collection a touch of class and sophistication. Each stand is hand poured. They now have a hammered look and come in two ...more info. Attractive display that measures 8" x 10". The fish is 4" long. Definitely not common. This jaw is heavily mineralized and solid. The jaw has three teeth with one being damaged. I don't come across many of these to offer. This one was found in a shell pit in Charlotte County, FL. Some of the edges do have some erosion. ...more info. This jaw section has 9 intact teeth is from the same late Miocene site as the rhino fosssil found elsewhere in our catalogs. 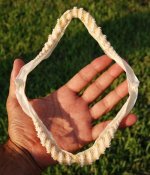 The jaw section is as ...more info. This jaw section with 2 intact teeth is from the same late Miocene site as the rhino fosssil found elsewhere in our catalogs. The jaw section is as ...more info. 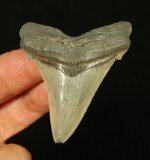 Two original teeth in this jaw from the rare mylodontid sloth from the Blancan aged deposits of the Aucilla River, FL. 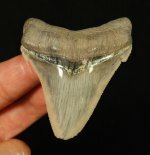 Unfortunately there are no teeth, but it's a very uncommon specimen from a desirable location. Labeled with Bob's catalog numbers. 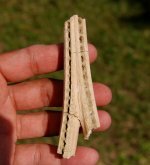 Recovered from the Gulf of Mexico years ago, this rooted tooth has had some of the end glued back. Otherwise, it's a great example. Mastodon teeth ...more info. 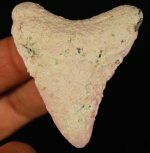 Very uncommon specimen recovered from the Gulf of Mexico off of Venice, FL. This nearly perfect tooth is still attached to piece of the skull. This jaw section with 5 intact teeth is from the same late Miocene site as the rhino fosssil found elsewhere in our catalogs. 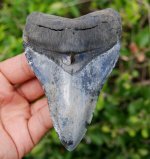 The jaw section is as ...more info. 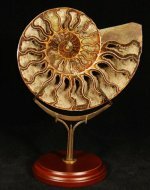 Display your ammonites with a touch of class and sophistication. These are not mass produced. Each is hand poured from a master that was meticulously ...more info. 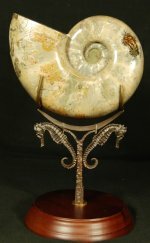 Display your ammonites with a touch of class and sophistication. These are not mass produced. Both stands have the ability to hold the same diameter ...more info. 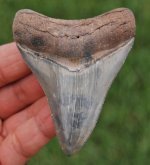 Quality tooth with sharp serrations and great color. 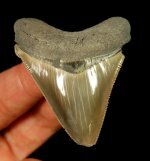 Very attractive tooth with super smooth enamel and sharp serrations. Tiny nick where the crown meets the root. Virtually no cracks in the enamel. ...more info. Nearly impossible to obtain anymore. I have not seen one in years. Beautifully prepared jaw with great teeth.